Final Fantasy Type-0 HD is a game about death. In spite of the presence of magic, monsters, and chocobos, it manages to capture the despair and terror of war better than any game I have played before. Does that make this game a classic for the ages? No, not by a long shot. But it is quite a good upgrade on the Japan-only original released for the PlayStation Portable (PSP) back in 2011. I was an unexpectedly huge fan of the earlier PSP title Crisis Core: Final Fantasy VII when it released, and Type-0 HD takes that action RPG style of combat and expands upon it with over a dozen new styles of play. 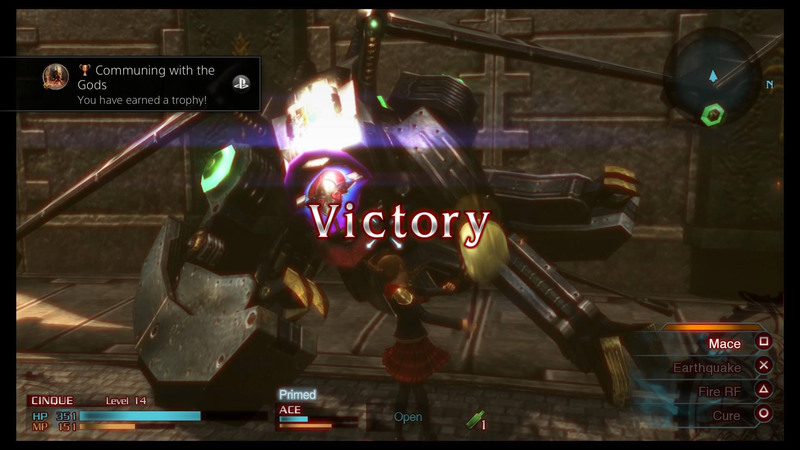 Combine that combat with the obsessive ruminations on death, and you have a very unique new title in the Final Fantasy series, and a pretty unique title in general. You know technology’s progressed to a creepy point when it can produce believably beautiful human beings. The new HD coat of paint on this game is pretty pleasant. It doesn’t meet the visual standards of other PlayStation 4 or Xbox One games, let alone the Final Fantasy XV: Episode Duscae demo that comes packaged with “Day One” copies of the game, but it is still an appreciated improvement over the dated PSP visuals; the lighting is especially noteworthy. The occasional pre-rendered sequence is absolutely beautiful in classic Final Fantasy fashion, being not just technically impressive but artistically dazzling as well. At one point, a powerful enemy freezes the clouds in the sky, and the clouds in the sky become a dungeon. How cool is that? As for the soundtrack, I have no complaints, none. Takeharu Ishimoto drops a collection of songs that pretty much always fit the occasion, ranging the gamut of emotional situations. Most of them end up being surprisingly catchy and hummable too, and his remix of Nobuo Uematsu’s classic series theme is drunkenly serene. If only such praise could be had about the voice acting. It’s not that the voice acting is bad, but it’s mediocre enough in places to be distracting. There are a lot of lines where actors emphasize the wrong words in the sentence, and I feel like that makes it a director’s fault. Some of the dialogue just sounds plain weird too, especially that of the character Nine, who randomly says the words “yo” and “hey” at extremely impractical moments in his speech. Luckily, he is only one of 14 playable characters you will regularly be using. Cinque clobbers her way to a close-call victory in the early portion of the game. It is really a testament to the game design that 14 playable characters (whom you can usually switch between at any save point, to make a party of three at a given time) all play distinctly from each other, and the vast majority are very fun to use. Each uses a different weapon that comes with its own timing to master. Timing is especially important, because enemies are often vulnerable to increased or fatal damage immediately before or after their attacks, and exploiting this becomes the only practical way to win certain battles. This lends a great deal of strategy and replayability to the combat, and you will definitely end up picking favorite characters. Additionally, magic can be equipped, and MP is regenerated by absorbing “Phantoma” from defeated enemies. Powerful special magic and Eidolons (aka summoned monsters) can be used too, but at the expense of killing your party leader, so I never actually used them. The reason why I was so averse to letting party members die is because the game penalizes you for it. Every story or optional side-mission in the game grades your performance, so you are encouraged to fight as fast and efficiently as possible (but all missions are replayable from the main menu once completed). And the game really does an excellent job of making you feel like Class Zero (your group of characters) is as scarily powerful as the story suggests. You can stylishly wreck the enemies once you get the hang of the controls, which are basically akin to Crisis Core or Kingdom Hearts but with swappable characters. I only wish the enemies were more varied; you will get intimately familiar with the few enemy types in this game. I also wish the final battle actually required skill, but that’s not the case. It’s a “story battle” that you can’t lose, which is a pretty big missed opportunity. Doesn’t this look like fun?! Doesn’t this empty field look like high-strategy action?! 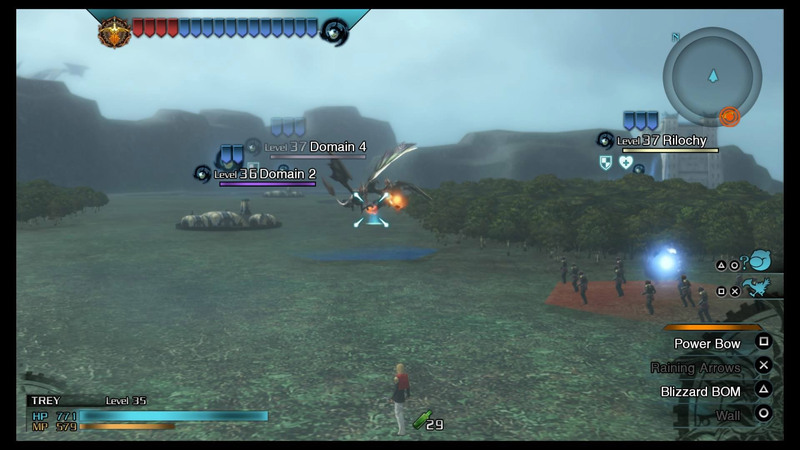 Another big oddity about the game is that it has optional missions where the game switches to real-time strategy battle on the overworld map. They are extremely basic battles, to the extent that your “strategizing” is limited to telling one or two of your bases which other specific base to attack, and with what type of unit (fire-users to attack bases, lightning-users to fight robots, ice-users to fight dragons) to use in the attack. All the while, you run around the world map as a single party member, attacking enemy armies as if you were just in another dungeon map, and occasionally entering enemy bases to do some real battles with a full party. The whole thing is just plain weird, and the fact that even the main story missions of this type are optional goes to show the developer was aware of it. It doesn’t help that most of them are virtually impossible to win without using a ranged attacker either. But personally, I still ended up enjoying these silly missions. “Cannot display the menu here,” is a metaphor for them not being able to articulate their feelings about the violence of war. Probably. 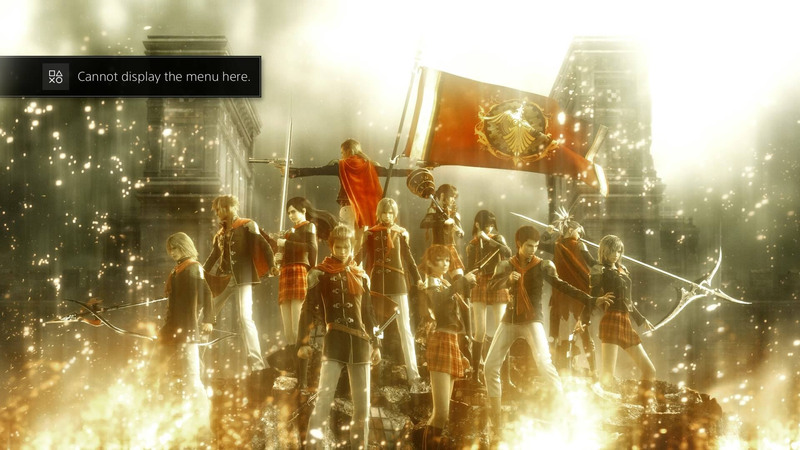 Final Fantasy Type-0 HD expects you to play it twice, as proven by its New Game+ option and numerous high-level optional missions. If you only play it to completion once (as I did), you will have no idea what causes major events toward the game’s conclusion, because most of it is kept a secret that is only revealed during your second playthrough of the game. This is a major violation of common sense, let alone good narrative storytelling. And unfortunately, the stuff the game withholds from us isn’t even very interesting, or so Wikipedia tells me. But if you set aside the complicated lore, what you have leftover is a simple war story told in the style of a documentary. It never dares to approach the lofty political heights of Final Fantasy Tactics, instead opting for gritty, in-the-trenches realism. There are four nations, each abiding by the will of a magical crystal, and in turn using the power of its respective crystal to prosper. In Rubrum, home of the Vermilion Bird Crystal, magic reigns, and teenagers are most adept at using magic. Thus, the whole of Rubrum’s Akademeia student body (including Class Zero) makes up the brunt of the army, which goes to war with the mechanized army of neighboring Milites. In other words, it’s magical kids versus men piloting killer robots. 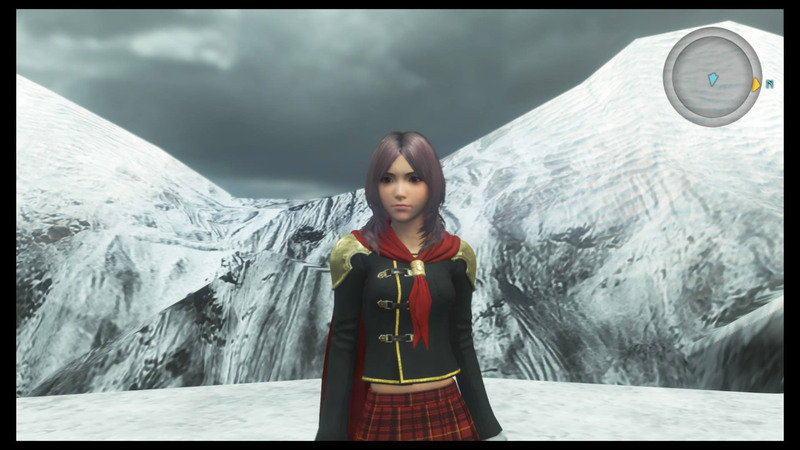 Final Fantasy Type-0 HD tries to do a lot of different things with varying levels of success. It’s a war story. It’s a meditation on the value of life. It’s a real-time strategy game. It’s an angrier Kingdom Hearts. There’s even an airship you can acquire, but without reading about it on the Internet first, you will almost definitely finish your first playthrough without knowing it ever existed. Ultimately though, for all its odd choices, I want to applaud this game for daring not to be a retread of Crisis Core, and for making an honest effort to tackle dark themes that are usually handled so lackadaisically in other video games. Plus, the combat is just darn good, which is really all that matters in the end. Anyone looking for a satisfying, challenging action RPG will be at home with this game. Let’s hope it gets a sequel. Agreed. There are definitely some other really dark RPGs out there, like Persona 3, but none of them have been as brutal as Type-0. It’s really great how the FF spinoffs get to do their own thing.